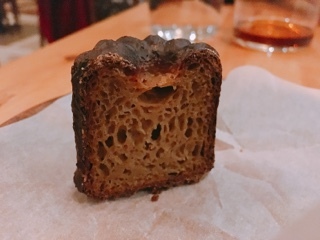 From the moment the bread arrived, I knew we were in for a treat. 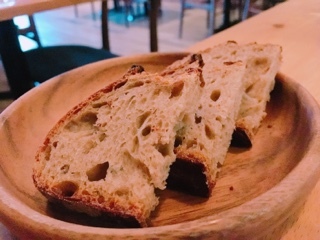 If you’ve sworn off carbs, good luck turning down a piece of Canis’ heavenly warm sourdough. It’s the perfect combination of slightly tangy dough, airy innards, and a smoky salty crunchy crust. I’d already be satisfied with the sourdough plain, but then swipe on the silky ricotta with an oily pool of chimichurri and the bread rises to another level. How did Chef Jeff Kang know the key to my stomach? I slather more onto the bread, trying not to be greedy, but wanting to wipe every last morsel from the bowl. What’s the other dish? Oh, a subdued garlic butter … it’s no ricotta. Feeling particularly ravenous, we added two “snacks” while waiting for the four-course menu ($60) to start. 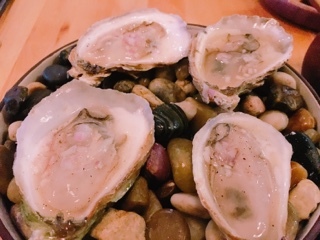 The oysters ($12) for the evening were four creamy Malpeque with a light daikon mignonette, which added enough acidity to cut through the seafood but wasn’t overpowering. Rather than the typical balls, the cauliflower falafel ($4) were in cylinder form so there was more crispy surface area. 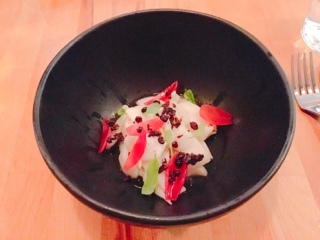 The chickpea mixture was nutty and fairly moist, but what brought it up a notch was the squiggle of eggplant puree and dots of pickled cauliflower on top (those cauliflower florets stole the show). 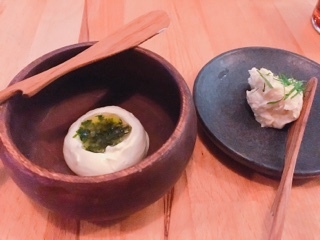 The only miss that evening was the scallop: the onion mignonette and shaved horseradish too strong, completely drowning out the delicate seafood. The dish might as well have used a cheap raw fish, I wouldn’t have taste the difference. 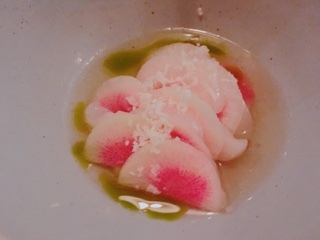 Meanwhile, if the sauce was more subdued (perhaps a diluted yuzu and olive oil), the alternating layers of supple scallops and crunchy radish would have been delicious. 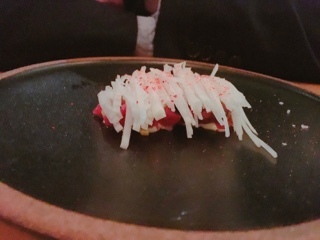 Conversely, the beef tartare, a dish that’s normally lends itself to strong flavours, was prepared simply. The steak was cut into larger chunks and sparingly seasoned - garlic aioli added creaminess and flakes of something dark added a wonderful saltiness. In lieu of bread, crunchy julienned turnip sat on top providing the same crunchiness, but also a adding a refreshing lightness to the starter. Included in the squid was a sizeable portion of the actual protein, cut into thick slices so there’s a meatiness to the dish. Thanks to the lonza, it became a rich appetizer, the cured pork adding a mellow smokiness. Tucking into the bottom, you’ll notice a thick but subdued squid ink sauce – infusing an umami sense to the dish, but does paint a black film onto your teeth (just remember to swish with water afterwards). 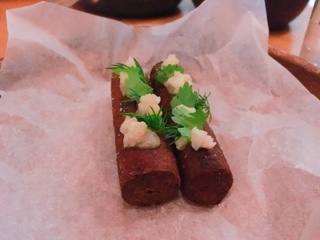 Canis likes to hide their meat, giving me the feeling that I’m digging into a salad – when really what waits underneath are flavourful strips of pork jowl, which is oh so tender but also incorporates a bit of chewiness from the collagen and fat. Yet, to the rest of the world, I’m just eating forkfuls of shredded Brussels sprouts tossed with jalapeno, pickle, and garlic flakes. One meat dish Canis doesn’t hide is their duck for two. 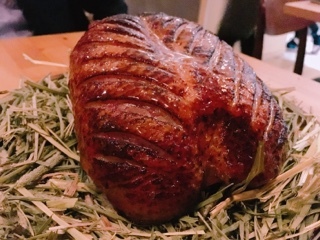 In fact, Chef Kang brings the glistening duck breast tableside for patrons to admire before it’s whisked away for slicing and plating. There’s much to admire: the skin is crispy and intricately scored glossed in a caramelized honey crust; the fat is rendered but there’s still a enough left underneath so there’s a lingering richness on the tongue; and the meat is aged so the chewiness of the duck’s meat mellows out and can be cooked to a medium rare without turning tough. The sides are equally delicious: the sunchoke purée a play between sweet and savoury; the roasted sunchoke slice perfectly done so it’s creamy inside and crispy around the edges; and for another taste of duck, a shredded duck confit cooked with wheat berries resulting in an intensely meaty risotto (I enjoyed it’s savoury taste that counteracts the sweet duck jus). 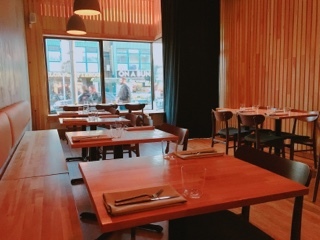 Truthfully, I’d love to try Canis’ other mains (sablefish and beef shortrib during our winter visit), but with the duck so good, it’d be a difficult decision as I’d hate to miss experiencing the meat again. 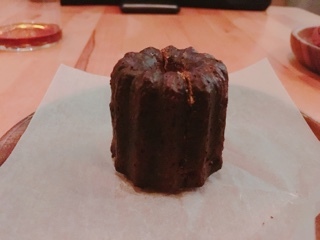 Choosing from the restaurant’s desserts is a challenge as other than three ingredients, there’s no description on what form the sweet comes in (i.e. cake, pie, ice cream, etc.) 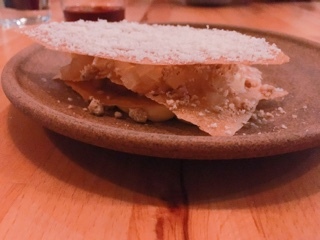 The “quince, buttermilk, hazelnut” turns out to be buttermilk snow with stewed quince and chopped hazelnuts on the bottom. It’s refreshing and could be a great palette cleanser, but hardly satisfying as a dessert. Meanwhile, the “pear, koji, almond” was closer to my idea of a dessert. Stewed pear, cut into small pieces and left with a slight crunchiness, is sandwiched in between crispy sheets of tissue thin pastry. 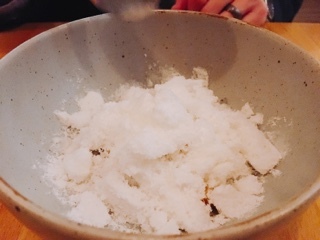 Our waitress explains koji is mold commonly used in South East Asian countries for fermentation – you can’t really see it in the dish and it’s unclear what it does (I did find there was a preserved plum (chan pui mui) taste to the dessert). Whatever it does, it’s delicious and I’d like to think gets the digestive juices flowing. At least they presented me with an espresso canelé with the bill – it has the requisite sweet sugary crust and soft airy centre . It satisfied my sweet tooth. Canis isn’t in-your-face Canadian - the wooden minimalist décor doesn’t have a stich of plaid or a single stuffed animal in sight. Yet, dining there reminds me of our country, from the staff’s diversity to the friendly non-pushy attitude. 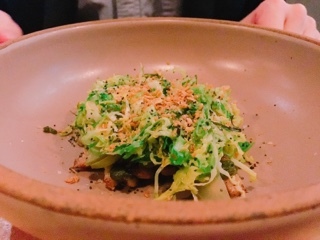 Even their dishes are portrayed in an understated way – the pork jowl and beef in the tartare aren’t the first things you see, rather it’s the humble but delicious turnip and Brussels sprouts; once you dig deeper, you get a whole new experience. 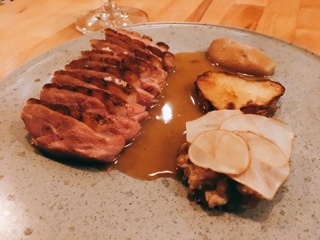 And you must experience Canis and their duck (assuming you’re not vegetarian or allergic) at least once. If you need an excuse, just consider it your patriotic duty.